Heat oven to 400°F. Place cereal in resealable food-storage plastic bag; seal bag and crush with rolling pin or meat mallet. In small bowl, mix cereal and olive oil; set aside. 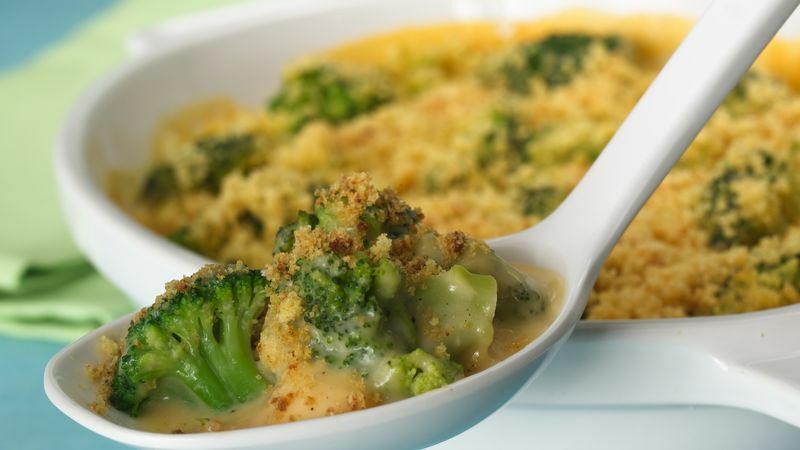 In 1 1/2-quart casserole, place broccoli; cover and microwave on High 3 minutes. Drain; set aside. Meanwhile, in 2-quart saucepan, heat margarine until melted. Stir in flour, salt, mustard and pepper. Cook over medium heat, stirring constantly with wire whisk, until smooth and bubbly. Stir in milk. Heat to boiling, stirring constantly. Boil and stir 1 minute; remove from heat. Stir in cheese until melted. Pour sauce over broccoli in casserole. Sprinkle with cereal mixture. Bake uncovered 18 to 20 minutes or until hot. "C" the flavor! Bake up an excellent source of vitamin C that's good for healthy gums, blood vessels and tissues. This basic cheese sauce is easy to make and can be used on a variety of vegetables. The flour is cooked in the margarine until smooth and bubbly before the milk is added. This step along with additional cooking, prevents the finished sauce from tasting like raw flour. A wire whisk helps keep the sauce smooth, but a spoon can also be used for stirring.